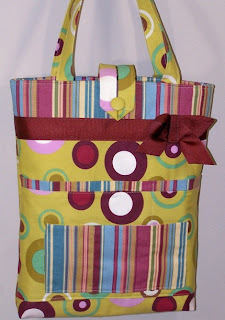 Whimsical Handbags, Laptop Bags, Diaper Bags and More!! Lugging your laptop around in an old satchel is a thing of the past! Mountain Gypsy Handbags add a bit of whimsy to the traditional laptop bag with handmade and custom designs! 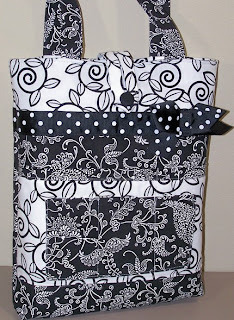 Her bags are made of high quality fabrics, great ribbon and are very sturdy. For the mom on the go, her laptop bags double as great diaper bags. View her Etsy store to view her great collection of over 60 handmade bags from tradtional to playful, she has a design to match everyone's style! Mark your calendars! Blessings and Bows will participate in a craft show on May 24th! Details TBA! I will be featuring crafters, artists, and the like, that have created items that have fun and creative ribbon and bows! If you would like to be featured on the Blessings and Bows blog, please email me and I can put you on my calendar! Our first feature will be coming soon! St. Patrick's Day Treat Bag! The St. Patrick's Day Treat Bags are here!!! Check out our etsy site for purchasing information! These can be customized and make great gifts for kids filled with their favorite candies! Don't forget about his month's special! 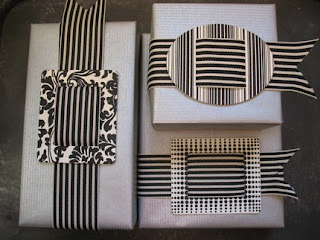 I have added 2 new fun and trendy product lines to my etsy site: http://www.blessingsandbows.etsy.com/ !! They include a red and chocolate brown damask clipboard and a chocolate brown and blue star cowboy style frame. Both are lightly distressed and perfect for anyone you know! Colors can be customized and names/initials can be added to personalize this for yourself or as a gift! Be sure to check them out!!! ****Just for fun.....anyone who purchases a Blessings and Bows product via www.blessingsandbows.etsy.com by January 31st will receive 15% off. Simply convo me through etsy or email me at aubrey@blessingsandbows.com with the code "B&B Blogger"
I have recently added the Bargain Bin section to my website! I will periodically put items on clearance and you can purchase those from the "bargain bin" section of my etsy site! Coming soon....new clipboard designs, as well as a new frame/cross gift set for boys and St. Patrick's Day as well as Mother's Day designs!